The Birmingham e-Learning Foundation (BeLF) is piloting the use of iPads by pupils in four schools in Birmingham this coming school year – Moor Green Primary, Hill West Primary, Clifton Primary and Osborne Primary. Each school has been looking at the different Apps and issues for using iPads both in the classroom and at home and all have now decided to roll-out the iPads to complete selected classes of KS2 pupils in Years 4 and 5 from the start of the new school year in September. Since 2001, the Birmingham e-Learning Foundation has worked tirelessly with Birmingham’s schools to enhance pupils’ educational attainment. Their focus has been to help provide computers, netbooks and now the very latest iPads as well as home broadband connectivity. To date over 35,000 pupils at 45 schools in Birmingham have been supported through various programmes. BeLF is dedicated to working with schools, parents and other partners in providing personal learning devices for ALL pupils in Birmingham. The aim is to reduce the effects of the digital divide by providing technology to aid learning both at home and school as technology is an important part of daily life. Having their own personal learning device to support their classwork motivates and raises pupils’ aspirations no matter what their circumstances. “In some ways this is business as usual for BeLF”, explains Ian McCall, Head of BeLF, “It’s classloads of devices, supported by grants, schools and parents, focused on Teaching and Learning gains. And it’s great to see our inclusive model continuing in difficult financial times. Miss Beth Clarke, Head Teacher at Hill West Primary School said, “We are really excited about this new initiative and know that the pupils will be too. The use of technology is imperative in a 21st Century Society and we want to prepare our pupils as best as possible, not only to be able to use it but also for it to support their learning and progress”. BeLF grants £48,000 to schools. We are pleased to announce that this month BeLF has granted £48,000 to schools to buy new learning devices for use by pupils for home / school access. 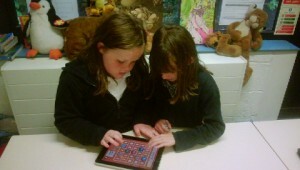 This includes funds to our four pilot primary schools to buy the new iPad 2s. The schools that have benefitted from this are Small Heath, Yardley, Bartly Green, Hillwest Primary, Osborne Primary, Moor Green Primary and Clifton. We will be keeping you informed of how the pupils will be getting on with their devices over the coming months.